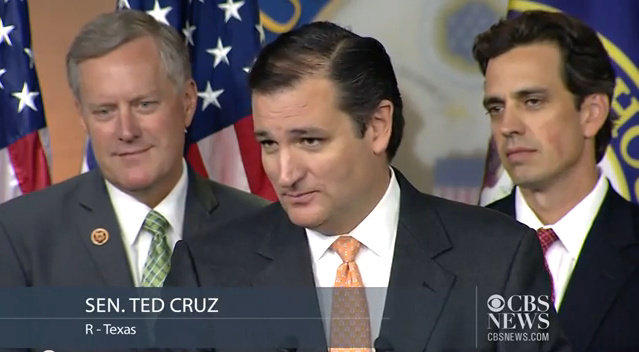 Is Ted Cruz’s promised Obamacare filibuster the equivalent of King Leonidas’s stand at Thermopylae? Because Ted Cruz is nobody’s fool, I’m guessing that he too knows that it won’t stop Obamacare from getting fully implemented within the next few months. Why, then, is Cruz engaged in this quixotic effort? I think I have the answer, but you’ll have to bear with me, because it involves taking a little trip back, back in time . . . to the Battle of Thermopylae. At the beginning of the 5th Century B.C., the Persian Empire was the largest nation in the ancient world. When Athens and Sparta refused to yield to its demand that the entire Ionian peninsula submit to Persian rule, its emperor, Xerxes, decided on a full-scale attack to bring these arrogant Greeks to heel. The Persian forces, having bridge the Hellespont, were advancing overland to the pass at Thermopylae. The Spartans, by inclination, temperament, and default, were quite obviously going to be the military leaders in any engagement with Persia. Thermopylae was therefore where the Spartans intended to take a stand. Although history remembers “the 300” Spartans who stood at the front of the line, the various Greek city-states managed to contribute another 7,000 or so troops to stand against the Persians at this hot, narrow pass. Even 7,000 troops, though, was a frighteningly small showing against the tens of thousands (or even hundreds of thousands) that Xerxes commanded. King Leonidas of Sparta had a simple battle plan. He placed his 300 warriors at the entrance to the pass, and stationed another 1,000 Phocians on the heights to prevent the Persians from outflanking the waiting Spartan force. The remaining Greek troops were massed behind the Spartans. The ambassador insisted more forcefully that the Spartans and their allies lay down their arms. Leonidas’ response has echoed through the ages: “Come and take them.” (Μολὼν λαβέ or “Molan Labe”.) The Persian ambassador then threatened that “Our arrows will block out the sun,” to which Leonidas’s general replied “Then we shall have our battle in the shade.” Battle was inevitable. I won’t humiliate myself or bore you by describing those three long days at Thermopylae. 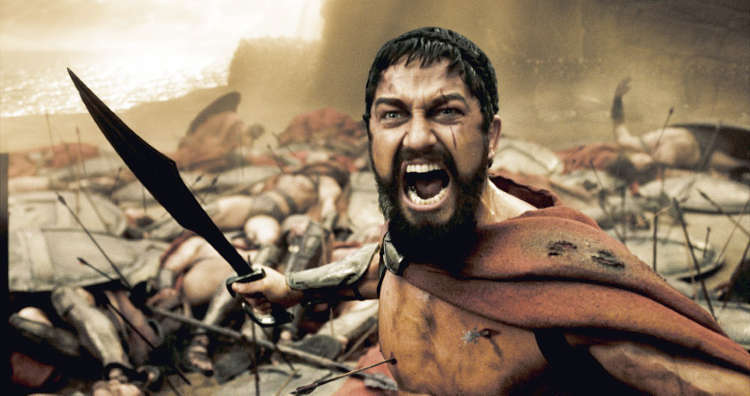 Suffice to say that it was brutal and bloody, and that every single one of Sparta’s 300 died that day. Another 2,000 Greeks died along with the Spartans. Importantly for history’s sake, though, is the fact 20,000 Persians died that day as well. Persia was not defeated but, as reports of the battle filtered out, every single Greek city-state learned that the Persians could be defeated. Even though the Persians continued their triumphant march forward, the Greek’s were roused by the heroism and sacrifice of the Spartans and their allies. Although the Persians moved forward, conquering Greek lands as they went, the Greeks abandoned submission and fatalism. Instead, looking to Thermopylae for inspiration, they fought back. They viewed themselves, not as future Persian slaves, but as free men fighting for their country. Eventually, the Greeks did defeat the Persian Empire, and went on to become a great empire themselves, laying the foundation for much of our western culture. Even now, 2,500 years later, the Spartans’ brave stand at Thermopylae still has the power to inspire us. Victory wasn’t the point. The point was to fight and to educate Greeks about their merciless enemy and its overwhelming drive for power. Leonidas and his men may have died there, but their ghosts led the Greeks to eventual victory. Which gets me back to Ted Cruz and his buddies in the Senate. They’re not stupid. They know that this filibuster will be futile. But they know two other things as well: Filibusters grab headlines, which gives them a golden opportunity to lift the cone of silence that the mainstream media places between Republicans and voters. Under the current media regime, Republican arguments and statements get to the voters only if small fry Republicans get arrested, or say something “provocative” about gay marriage or abortion. Other than that, most voters would be hard pressed to know what conservatives politicians and thinkers are saying.